"I'm a free-market Republican." 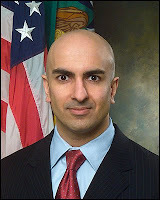 said Neel Kashkari at an American Enterprise Institute conference on Sept. 19, 2008, just days before he was asked to lead an unprecedented and massive U.S. government intervention to rescue the U.S. financial system from total collapse. Who is Neel Kashkari? He is the 35-year-old son of Kashmiri-Americans who grew up in Akron, Ohio. Trained as an aerospace engineer before attending Wharton Business School, he comes from a family of scientists. Father Chaman has a doctorate in engineering, and won a Presidential award for his work in getting water to African villages. Kashkari's mother, Sheila, is a retired pathologist, and his sister Meera, specializes in infectious diseases. Kashkari has been a close adviser to Treasury Secretary Henry M. Paulson Jr. on the credit crisis and helped draft the legislation for the massive rescue plan. He has been designated as the Interim Assistant Secretary of the Treasury for Financial Stability. In this capacity, Mr. Kashkari is overseeing the Office of Financial Stability, including TARP, the $700b Troubled Asset Relief Program. As TARP chief, he will have the powerful position to determine what non-performing assets and out-of-favor mortgage-backed securities to buy and at what price. In a way, his decisions will have long term impact on how the US financial system performs now and in the future. The choice of young Kashakari has come under criticism by the respected Wall Street Journal in a recent editorial. The editorial said: A problem now is that Treasury Secretary Hank Paulson still hasn't shown he knows how to use his new tool, and his appointment of a 35-year-old former Goldman Sachs employee as the auction czar doesn't call to mind Paul Volcker arriving at the Fed in 1979. With no disrespect to Neel Kashkari, who is Mr. Paulson's choice, a financial panic is a bad time to be introduced to global markets. At a minimum, Treasury should have done better than leak his name to the newspapers. This is the kind of roll out that needs to be better than seat-of-the-pants -- and continues the problem of weak execution at Treasury. Time magazine says this about Kashkari in its recent issue: For a position this important, Kashkari, the American-born son of Kashmiri immigrants, may seem an unlikely pick: he's been in finance for only eight years, two as a student at the Wharton School and four as an executive in the San Francisco office of Paulson's old firm, Goldman Sachs. At Goldman, Kashkari was so low on the food chain that he only got to know Paulson well after they both moved to the Treasury in 2006. But Mr. Kashkari has powerful defenders. A spokesman for Congressman Barney Frank, the liberal head of the House Financial Services Committee, calls him "very knowledgeable and very smart." Kashkari's assignment offers him a great opportunity to learn to deal with tough issues in the company of the best, the smartest and the most experienced economic leaders with plenty of scars. But this is also a dangerous assignment with uncertain results. Young Kashkari's mettle will be mightily tested in his powerful but temporary job which will last at least until a new president is inaugurated in January 2009. Kashkari is not the only high-profile South Asian making news in the midst of the biggest financial crisis US has faced since the Great Depression of the 1930s. Vikram Pandit, also an engineer and the current the CEO of Citigroup, is credited with saving his firm from meeting the same fate as Lehman Brothers. He engineered the rescue without Uncle Sam's help. Recently, though, he suffered a setback when Wachovia spurned Citigroup's bid to buy it and chose to go with Wells Fargo instead. With dozens of people of South Asian origin, including former Pakistani prime minister Shaukat Aziz, having served or serving in responsible positions in the US financial services industry, South Asian banking and finance expertise is coming of age.